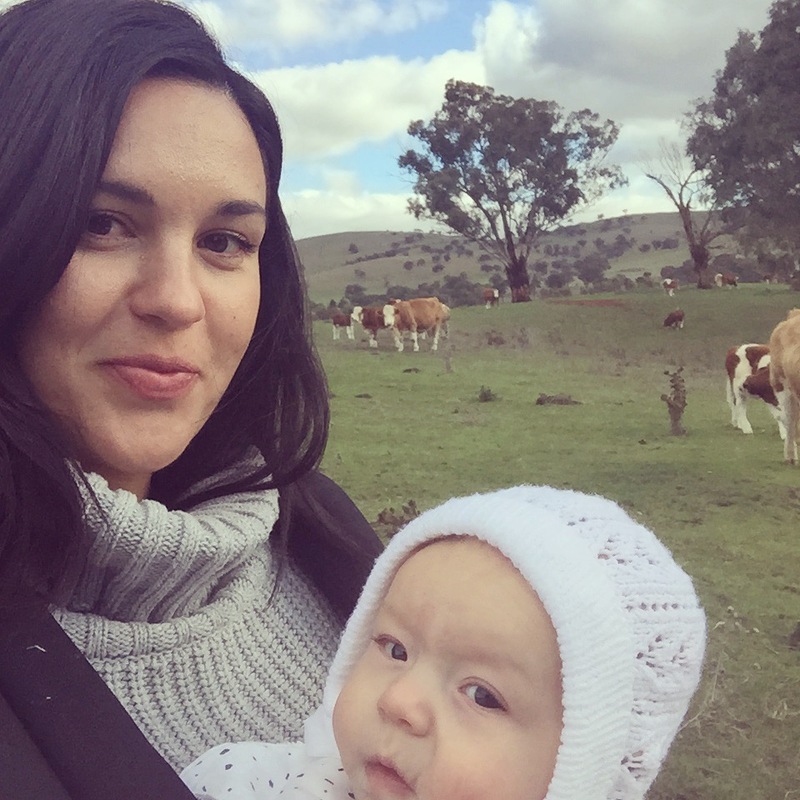 I am a practising midwife at Wodonga Hospital and have a passion for empowering women and their support people in achieving the birth they want. I am employed at the local hospital in the Maternity Unit, so have regular hands on experience. Registered member of CAPEA (Chilbirth and Parenting Educators in Australia), ACMI (Australian College of Midwives), Maternity Coalition and International Institute for Complementary Therapists. Let me guide you and help you prepare for an empowering birth experience and positive journey into parenthood. Learn the practical skills of relaxation, breathing and visualisation to alleviate the fear, anxiety and tension experienced during pregnancy, labour and childbirth. Calmbirth refresher class Five hour session for those who have completed a full calmbirth workshop previously. Includes morning tea and light refreshments, Calmbirth book and USB of guided relaxations. These are subject to change. Other dates available if required. Calmbirth Refresher Class. (For couples who have attended a calmbirth class previously). Dates can be arranged at a mutually convenient time. Other dates can be arranged at a mutually convenient time. I'm so excited to be able to tell you my story....All I can say is GO CALMBIRTH!! My waters broke at 9.30am, went to the hospital to check the baby's heart rate, everything was good so they said we could go home. They suggested a walk to get things moving along and told us to come back at lunch so the Dr could check me out. So we went for a walk along the river and mycontractions started on their own. Went home after that and spent the next few hours using the breathing techniques and lots of swaying/rocking whilst leaning over the bench/couch/sink/hubby and they gradually increased in intensity, though very bearable and no pain! I was amazed at how fantastic I felt. It was so true about all those women on your DVDs saying it felt like pressure....It was amazing that I didn't feel any pain. At lunch we went back to the hospital and I was hooked up to the CTG and the Dr examined me. (at 1pm he said I was 3cm dilated but he could stretch me to 5-6cm and lots of extra fluid came out- and got his sleeve hehe). They let us go home again (very happy about that) as I was progressing nicely. Told us to come back when the doctor's surgery closed at around 5pm. So went home and spent some time sitting and breathing through the waves listening to our relaxation music whilst Drew had a sleep!!! They started to slow, so I got up and moved about then they increased and I was starting to get noisier. Threw up twice, and knew things were getting closer when I was grunting and starting to feel a lot of pressure, and feeling like I wanted to push. I was very ready to get to the hospital at this point, about 5pm, so we drove there, me screaming at Drew to hurry up as all I wanted to do was push my baby out! Got to the hospital, and walked straight into the birthing suite as all I wanted to do was push, but was told to wait for the Dr as he wanted to see if I was fully dilated. He came about 20 mins later and after a lot of huffing and puffing and trying not to push, he checked me out and the baby was already in the birth canal! I'd done all the hard work at home! So I got to feel the baby's head and it was a finger length away from arriving! Very promising that it was so close! By this time it was hard work, but still no pain! I had about an hour of pushing, lots of pressure, and feeling like I wanted to poo! Drew was great, offering me water, and not talking, and letting me grab his arm as I pushed with all my might. The midwife had read our birth preferences, which I had followed from the calmbirth booklet and she respected our needs and didn't speak unless I asked a question, and no drugs were suggested. I didn't even consider them anyway! Amazing! After lots of pushing on all fours on a bean bag on the floor, I changed positions. Standing up was too hard, and lying on my side on the bed was too awkward, so I ended up delivering her on the bed on all fours, and the only time I felt any pain was when she crowned. We have a beautiful healthy baby who I adore with all my heart! I'd like to thank you Kerri-Ann for teaching me about calmbirth, and empowering me to have the best birth I could ever have imagined. It was a fantastic experience, and people are amazed when I tell them I had a great birth, and I pass all the accolades onto calmbirth in the hope that more women can learn about this fantastic way to bring a child into the world. So all up, I would say from start to finish, it took about 8.5hours, and I was expecting double that! The midwife who was there during my birth kept saying how well I had progressed, and how calm and relaxed I was, and I know that I couldn't have done it without calmbirth. Summer's heart rate was consistent throughout the birth and I felt totally in control and able to cope with all that labour had to bring. So thank you once again!! After the birth of my first child I was left feeling traumatised. As I lay alone in the hospital room, just hours after the birth with my new baby next to me, I had scary flashbacks. When my doctors came and saw me the next morning I felt I should just be grateful that I had a healthy baby. It didn’t even enter my mind to ask questions about her birth. For the next two years I felt upset whenever I heard a natural birth story. Somehow I felt that I wasn’t woman enough for childbirth. These feelings interfered with my early parenting. The first year of my daughter’s life was marred by anxiety. I didn’t seem to be able to believe she was fine and I was fine as a mum, as a woman. Calmbirth changed all of this. 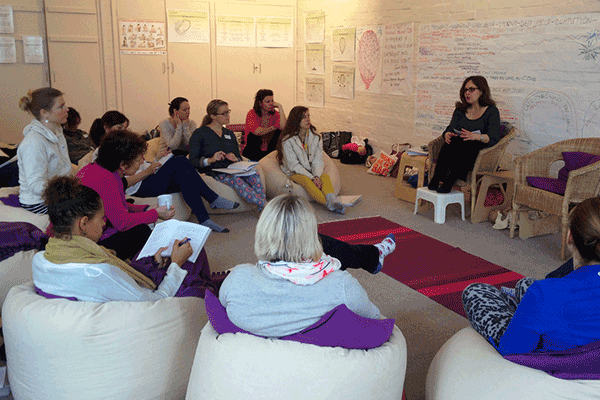 After our first morning of Calmbirth classes I spoke to Kerri-Ann about my first experience. Kerri-Ann listened carefully,then explained what happened in that birth. She told me what a wonderful job I had done with the first stage, and that it wasn’t my fault that intervention was used. What relief! Finally I understood. It was time to focus on the birth of my second baby. I was four days overdue, and six days into an injury of the ligaments across my belly brought on with the beginning of a very painful 36hour pre-labour. I had been using calm breathing to cope with the pain of the injury, and surprised even myself by being able to keep calm and excited as the hours ticked by with still no labour. I was unable to stand up for long, and so spent a lot of that week in bed thinking about the labour. My overwhelming feeling was of excitement, when doubt and anxiety came along I was reminded of the story on the CD. I was able to go within, I already knew everything I needed to know, I must listen to myself. My partner knew this too, and kept reminding me how strong I was and telling me what a great job I was doing coping with the injury, with not being able to look after Maisie- which I was very sad about. With a little pop at 9pm my waters began to leak. After a quick check on the baby at the hospital we were sent home as no contractions ensued. By the time we got to the car park however I knew I was in labour, and we both smiled and laughed all the way home. Once there I lay in bed and started my calm breathing, there wasn’t time to go to labour land as there had been with my first labour, as the contractions quickly got closer together. If I started to think too much about how they felt, I just imagined holding my baby. My baby was coming soon! I had been waiting so long for this day. With these thoughts I lay and counted my breaths. Within an hour we were back at the hospital. As my midwife Wendy took my observations and started talking to me about my birth wishes I had to tell her when I was having a contraction. She couldn’t tell because I was so calm! Jeremy gently touched my back on the out breath, and reminded me how strong I was. By at about 11:15 Wendy asked if she could do an internal examination. Before she did this I reminded her I didn’t want to hear anything negative, that’s how much I knew what I needed! We were both surprised when she found I was about 7cm already. I really felt it was very easy, and instead of bracing myself for those final cm’s, I embraced them. Each one was bringing my baby closer! Calmbirth had given me an amazing gift- to know how to see these feelings and to focus on what was important. I was amazed when at 12.05 I felt the need to push- surely not yet? Surely there was much suffering to go through first? Skye arrived soon after. It seemed birth was imminent. Then the baby turned posterior! For the next two and a half hours I worked with Skye, Wendy, Jeremy and my other birth partner, my best friend Emily to try to get the baby to come out! There was a big ache in my back, but it was nothing really and my overwhelming feeling was still of calm excitement. I was able to comment on how cheeky the baby was, and felt like laughing when the remaining waters broke and again when Wendy broke it to Skye that the mirror was broken when she asked for it. Eventually Skye suggested an episiotomy. Straight away I knew that was the right thing. I felt that even during my practice I found it very difficult to relax that area. I knew that was what I needed and happily agreed. I had been working very hard and knew that physically my strength was waning. Up on the bed I was surprised to discover that being on my back, looking at my tummy and bracing myself against Jeremy and Emily was the right position for me. When I pushed I lifted my pelvis. We worked as a team, everyone was involved, everyone was encouraging me and I them! It was beautiful to be surrounded by these wonderful people and to work so hard to birth my baby. It was incredible to feel his head when it finally came out, and then to feel the shoulders and whole body. To lean forward and discover that it was a boy was just fantastic. I held him to me and he calmed down. Jeremy announced his name. The room was joyous. I kept exclaiming, “I did it! I couldn’t have done it without my team and I did it!” Our baby was not a pretty picture, but we were in love immediately this time, and just so happy! Once Skye helped me feed him I felt the birth was complete. Wendy was first to leave. I found out later that she hugged Skye, she was amazed by the experience. Skye was next after lots of chatting and celebrating. It was her birthday and she had to get some sleep before a big day ahead. Emily found it hard to leave, we were all so caught up in reflections of a wonderful birth and the new baby Clancy. When she went Jeremy and I just basked in the glory of the whole thing. Reminding each other of funny moments and telling each other how we had felt at different times. Looking at Clancy- in bliss. It was six in the morning before I convinced him to go home and get a little sleep before our two year old Maisie woke up! The whole time I hadn’t felt the need to ask for pain relief at all. I was overwhelmingly motivated by the image of holding my baby, and my perspective on the pain never changed, it was bringing him closer. It’s hard to describe, I know that I felt pain, especially in my lower back, but it was so out of my focus that it really didn’t matter. Over the next few days I noticed a different Michelle had been birthed that night. I was confident, I was strong, I knew when to ask for help, how to deal with worries and what to be afraid of (or more importantly not be afraid of). Jeremy and I had shared something remarkable and we had seen with greater clarity how strong our love was, what we could handle together. His support and understanding in those early days was remarkable. Wendy was wonderful. We too had shared something special and every time she worked in the following days she would come and talk to me. At first we reflected on the birth, in celebratory style. It took me a little while to realise how touched she was to be part of it. It was wonderful to hear her story, how all the moving around had in fact helped move Clancy down. After that was done she would come and just talk. We had become friends. Clancy often went on little adventures around the hospital when Wendy was at work! Skye called a few days later and we talked over the birth from her perspective. I felt all the better to find out he came out with the very widest part of his head first! My family have since commented, and I’ve seen it in myself, an inner strength becomes an outer strength. Jeremy and I have tackled every challenge, from the pain of stitches, mastitis and worst of all engorged, over supplying breasts. Nights where we have had to be up with Clancy all night, and toddler stubbornness to boot! We are calm parents working as a team. Friends are amazed at how “well” we look. For me it’s been a rite of passage, and I finally feel like a woman. Thank you Kerri-Ann, you’re an angel. 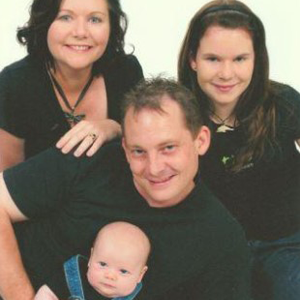 During the last trimester of pregnancy, my husband Nigel and I had five weeks of calmbirth classes with Kerri-Ann. After these, I listened to the CD’s daily, reread the booklet and practiced the breathing techniques on a regular basis – walking, going to sleep, during Braxton hicks and leg cramps. At 33 weeks I was diagnosed with Gestational Diabetes and told by my obstetrician I will probably be induced at 38 weeks! I successfully managed the gestational diabetes through diet, exercise and daily monitoring. I was still induced, but it was three days after the due date. Close to the induction day, I had severe doubts in my ability to perform a calmbirth. I panicked! Then I realized I had to put 100% into trying, otherwise I would NEVER know if the calmbirth techniques would have worked. I told myself - if I stayed calm, I could potentially avoid interventions or tearing. I read the calmbirth booklet again and listened to the CD’s at least twice a day...At 10.00am I had my membranes ruptured and was put on an intravenous drip and the contractions or ‘waves’ began. I automatically began my well-practiced ‘breathing’ technique whilst sometimes visualizing the rainforest where Nigel and I had our honeymoon. Breathing deeply and slowly in through the nose, counting 1,2,3,4, and then calmly breathing out through the nose, counting 1,2,3,4. I wanted an ‘active’ birth, so remained standing the whole time, walking around with my ‘inducer buddy’. I still ate, drank, laughed, answered questions and rested between contractions. The midwives were really supportive; they read our birth plan and had attended some in-services already about calmbirth by Kerri-Ann. Nigel changed the music CD’s we’d created ourselves, lit my fragrant ‘melts’ for me and stuck on the window the positive affirmations friends had written onto a poster for me during my ‘blessing way’. These all contributed to me staying focused for the calmbirth. As my contractions became more regular I lifted each foot and swayed my hips, whilst leaning on the edge of the raised bed. Nigel either massaged my lower back, or used light-touch massage learnt during the calmbirth classes, running the back of his hands from my shoulders down to my arms. I used the gas to take the ‘edge’ off the pressure in my lower back, which felt like a heavy bowling ball was trying to push its way out. I also used the gas to consciously slow my breathing, the deeper the breath I took, the louder the rattle of the machine. When the contractions felt like they were overlapping, my obstetrician thought to check my dilation. I heard someone say I was 7cm. A midwife suggested I roll on my left side to see if it would speed things up. When I did - WHOA!! I could feel my body pushing out the baby! It was amazing! As learnt during calmbirth class, my uterus muscles were expulsing the baby with no effort from me at all! I could picture it. I was asked if I still needed the gas, I said I didn’t but was concentrating on my breathing too much to remove the mask myself. Nigel took the gas mask off my face and without it I started panting quickly and the midwife reminded me to concentrate on my calm breathing, which I immediately did and am thankful for because it meant I could relax between contractions again. I’d also begun to moan, which I couldn’t stop, so just relaxed and let my body do what it’s designed to do. After about half a dozen contractions, I felt the top of the baby’s head as it crowned. The obstetrician and midwife said the head may come out on the next contraction, so I did a ‘push’ to help and out it came. I took a break between contractions and told them I’d assist pushing the rest of the baby out on the next contraction. This ‘push’ was shorter and at 2.07pm, our Joshua was born! He was lifted up to lie on my chest but the umbilical cord wasn’t long enough for him to reach, so he lay across my soft belly whilst we waited for the cord to finish pulsating. Then Nigel cut the cord and our little boy was put on my chest for his first breastfeed. Joshua’s eyes were wide open as his mouth searched for the breast! While he tried to feed, we all watched on in awe. Although my birth didn't go exactly to plan Calmbirth gave me the ability to remain relaxed and in control. When l had skin to skin straight after my daughter was born l turned to my husband and said "l could do that again!" Kerri-Ann is amazing at what she does. I work alongside her as a midwife and she is incredibly passionate and knowledgeable. I highly recommend Birth and Babes Calmbirth!